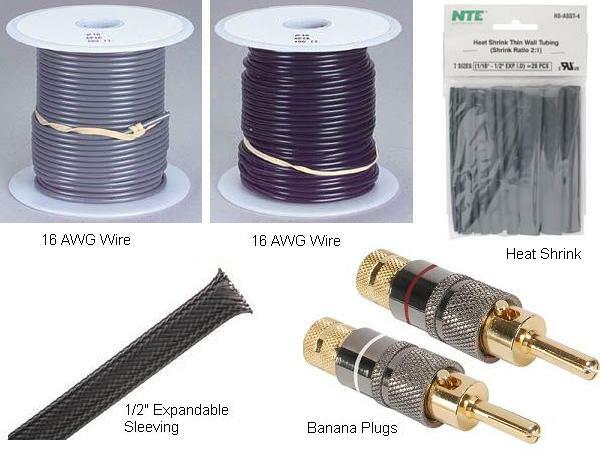 Scale the required materials for the length of speaker cable you will be building. 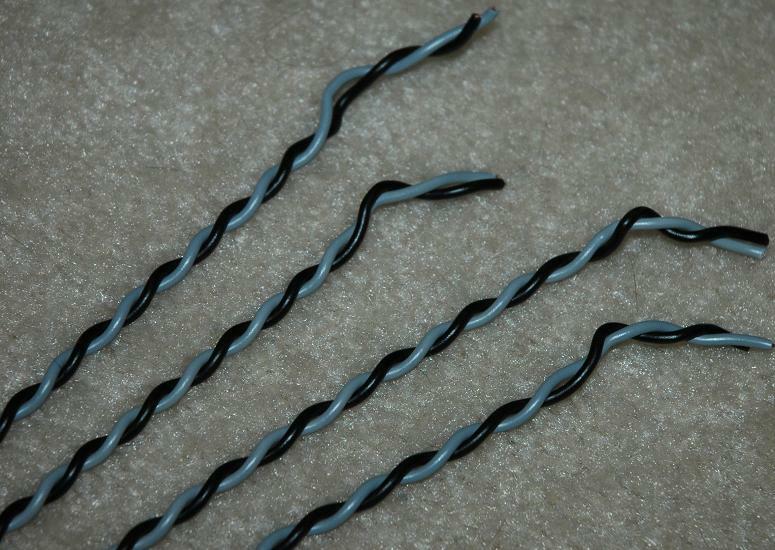 Of course you can use your favorite choice of materials for the wire, sleeving and termination. The idea behind this speaker cable design is fairly simple. Four 16 gauge wires (resulting in a combined 10AWG) are used for each speaker conductor to lower the overall resistance of the speaker cable. 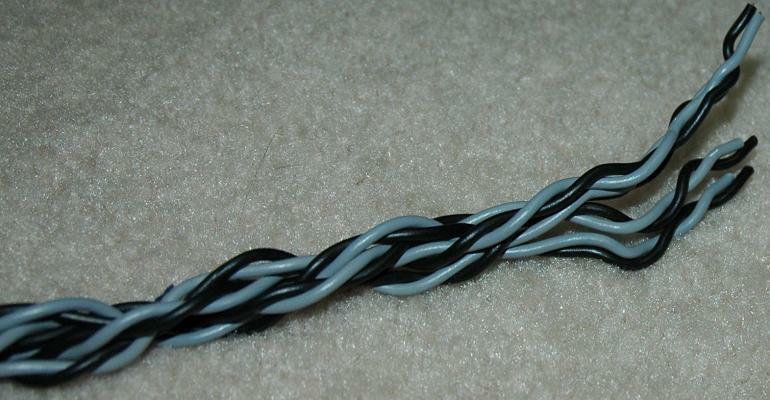 With regards to the speaker cable geometry, the wires are twisted together in opposite directions (see photos and description for more details). This helps reduces asymmetrical field interactions since the wires are not on either the inside or outside of the cable more than any other wire. It also helps to keep the inductance of the overall speaker cable at a minimum. For speaker cables, low-inductance is required to prevent attenuation of the high-frequency response within the audible range. Construction of the speaker cables is fairly simple. 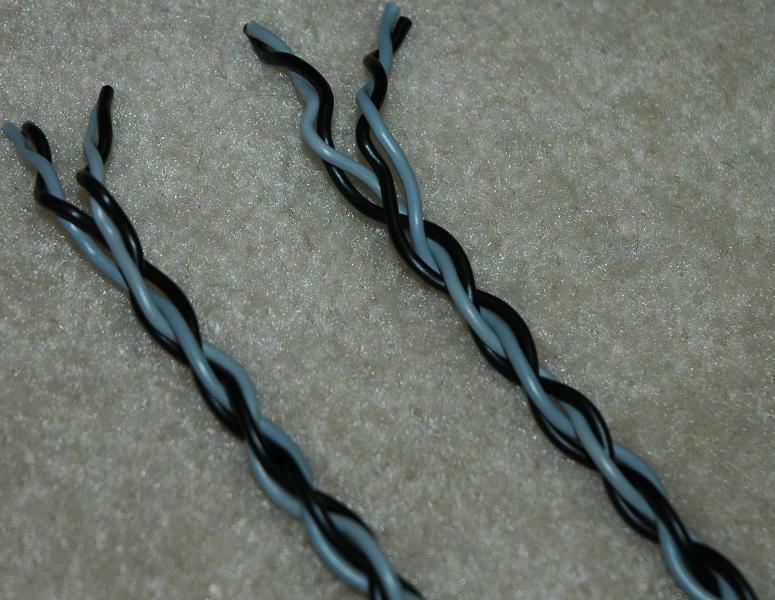 Make four twisted pairs of 16AWG wire. The pairs are twisted together in a clockwise direction. You will need two sets of four twisted pairs for each pair of speaker cable. Next, take two of the twisted pairs from above and twist them together in a counter clockwise direction. Repeat this step for the remaining twisted pairs. Using the above twisted cables, twist them together in a clockwise direction. Repeat this step for the remaining twisted cables. Next, the Techflex cable sleeving is pulled over the twisted wire. Heat shrink tubing is used to hold everything in place. The ends are separated and then twisted together following the previously noted geometry. To add a little personal touch, I used a $20,000 Markem-Imaje 7031 30 Watt laser to mark the wood. I work for the company, so I have access to this equipment. The wood is a large oak dowel that I simply drilled through. The oak sleeve was hot glued into place. The ends of the speaker cables are terminated with locking banana plugs. Of course you can use whatever sort of termination you prefer. 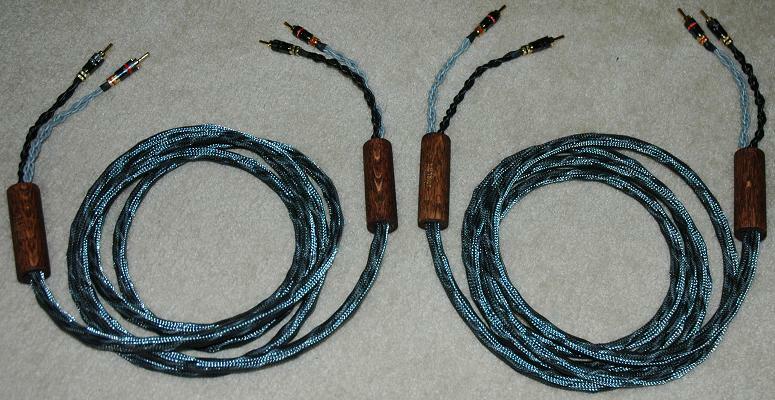 A photograph of the finished speaker cables is shown in Photograph 8. Table 2 shows a comparison of this DIY speaker cable project with some more expensive commercial speaker cables that are available. Note, the cable costs per foot do not include any cable termination. * Commercial cables measurements are from the respective manufactures website. ** Approximately $500 for a complete terminated pair of 3 m (10 ft) cables. As you can see, the electrical properties of these low-inductance DIY speaker cables are generally as good and in some cases better than commercial cable offerings that can cost many times more.